Thirty-six years and one day after that infamous night in New Orleans, a Panama-based Jamaican, Nicholas Walters, succumbed to the first defeat of his career when he, too, threw in the metaphorical towel after seven rounds of increasingly one-sided befuddlement against the peerless Vasyl Lomachenko. As if to underline the similarities, Walters’ trainer even uttered those same two words to referee Tony Weeks as the boxer explained his disinclination to continue. Angry boos greeted the disappointing conclusion which had immediately become the story, distracting just a little – and unfortunately so – from what had brought it about: an extraordinary display of boxing ability from Lomachenko, a two-time Olympic gold medalist who, just eight bouts into his professional career, is displaying a mastery and degree of dominance over his opponents that few boxers could even dream of achieving after ten times as many contests. In theory, this was a mouth-watering matchup between two former featherweight champions now both competing in the 130-pound division. The undefeated Walters had made his name obliterating veterans Vic Darchinyan and Nonito Donaire with his skill and blistering power; Lomachenko had glided effortlessly toward the top of pound-for-pound lists with his precociousness, balletic footwork and suffocating punching combinations. It promised to be an intriguing clash of styles, but by the midway point of the very first round, it was already apparent that the Ukrainian’s stylings were more likely to be in the ascendant. After Walters (26-1-1, 21 KOs) started with a solid enough jab, Lomachenko began to judge his timing and distance. Toward the end of the opening frame Lomachenko was already displaying his famed movement, slipping to his right and outside Walters’ left hand before landing a sharp southpaw left of his own. That move would be the basis of everything that Lomachenko (7-1, 5 KOs) would do throughout the evening, moving out of range of Walters’ dangerous right hand and putting himself in position to land blows of his own. Whereas Walters, seemingly confused by his opponent’s speed, appeared hesitant to throw punches at a moving target he was afraid he would miss, Lomachenko just kept on throwing, touching Walters with southpaw jabs and unleashing straight lefts once he pivoted into place. The punches weren't yet hurting Walters, and not all of them were landing flush, but they were scoring. On top of that, they were causing the Jamaican to keep his own offense holstered, and importantly, theyenabled Lomachenko to dial in on his timing and his range. 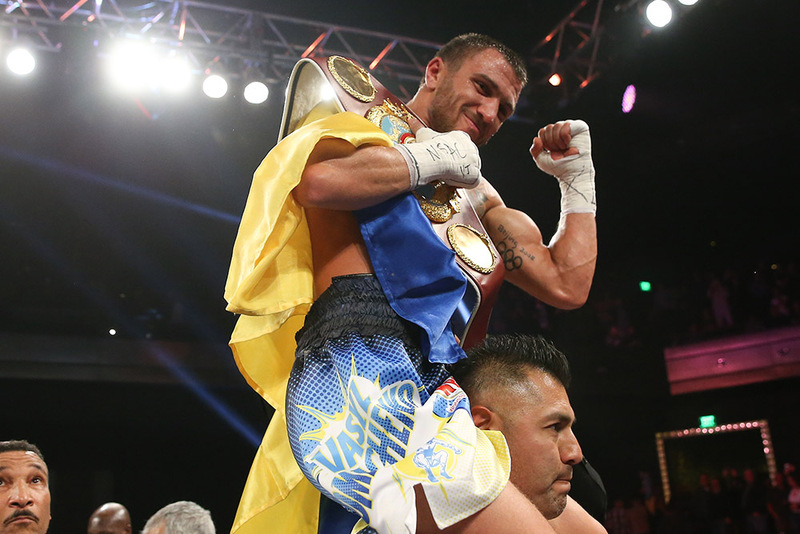 As the rounds rolled past, Lomachenko increased his output and stepped forward to land his blows with greater venom. In the fifth, he stood in front of his foe, throwing punches to Walters’ gloves and then, when the “Axe Man” dared to wing a right hand in his direction, slipping inside it, sliding to his right and landing a quick combination of right jabs and left hands before Walters could reset. By the seventh, the Ukrainian was in complete control, knocking Walters off balance with his movement and then chasing him across the ring with his punches. Those punches were now landing cleanly, snapping back Walters’ head, and every time Walters managed to regain his balance as if to throw back, Lomachenko had disappeared, only to pop up in a different spot and resume his assault. As the bell rang to end that round, Walters looked discouraged, and he trudged back to his corner likely wondering how he could endure five more rounds of embarrassment. By the time he sat down on his stool, he had evidently come up with his answer: he would not even try. He stood up and sought to walk across the ring to congratulate Lomachenko, only to be intercepted by Weeks, who asked several times what was happening until he was sure. As the referee waved off the contest, Lomachenko celebrated and the crowd complained; Walters protested unconvincingly afterward that the problem was somehow related to the fact that he had not fought for almost a year while the former Olympian had been more active. He said also that the blows in that seventh round had been telling, and that his temple hurt. But he knew, and so too did the crowd, what had really happened: a very good fighter had come up against an extraordinary one, and been embarrassed. He had been fully clowned, and he wanted no mas.